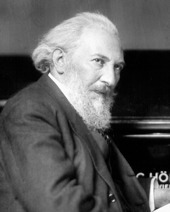 Born in Vienna the son of a not-too-successful Jewish businessman, Edmund Eysler struggled to make a career as a serious composer in his early years and had to support himself through teaching piano. His luck changed when he met the librettist Ignatz Schnitzer – who had written the libretto for Der Zigeunerbaron, which Johann Strauss II had so successfully used for his operetta of the same name. Schnitzer gave Eysler a libretto originally intended for Johann Strauss – but, after very substantial reworking by another librettist, this time the resulting huge success was for Eysler - the operetta Bruder Straubinger. Eysler became a firm friend of the well-known singer Alexander Girardi for whom he wrote many operettas. This friendship enhanced Eysler's long and prosperous career. Eysler enjoyed success in Austria and Germany but the rather 'folksy' Viennese character of his many operettas seemingly deprived him of international success. During the Nazi regime and the 1938-45 annexation of Austria, Eysler did not emigrate but went into hiding, protected by his family and friends. After the liberation, however, he found renewed recognition in Vienna where he was a loved and respected figure. He died there in 1949 when, most unfortunately, he slipped on a step whilst going to receive an ovation from an admiring audience.